I have a theory about a human “anti-freeze” phenomenon . It is based on my experience with winter and living my entire life in the northern hemisphere. Those of us who live where the snow falls and temperatures can drop into -30C to -40C range (and colder if you factor in windchill), well, we learn about dressing warmly. We have anti-freeze in our car’s windshield washer fluid. We buy fleece lined vests and woollen socks and down-filled gear. 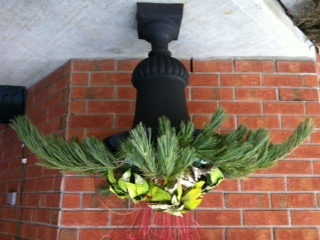 When winter first takes its place out our front door we shiver and shudder. We find it very cold and we begrudge putting on the layers and the winter boots and the scarves and hats and on and on. Then gradually, we become used to it and it doesn’t feel so cold. My theory is we have some human anti-freeze that builds as winter progresses. It makes the cold tolerable. Due to a design error, our human antifreeze does not have a very long shelf life. It starts to dissipate somewhere around the end of January. Slowly it ebbs away. If our bodies came with fluid level lights (like our vehicles do) the low-level anti-freeze light would start to flash. And then it feels cold no matter whether the temperature is moderating or not. I recently read an article that put forward a hypothesis about why it feels colder as winter starts to exit. It wasn’t an “ah ha!” moment for me. I prefer my anti-freeze theory. Those of you have lived or do live in colder climates-do you think you run out of tolerance for cold as winter ebbs? Tell me it’s so. Think of something else: here’s a few pictures of some things that took my mind off thinking I was cold this past week. 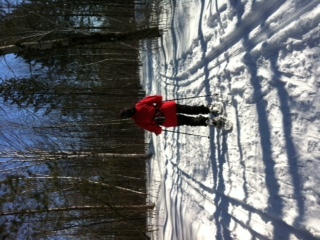 A sunny day, mid-week snowshoe with a friend and a tremendously tasty dinner cooked by my husband. 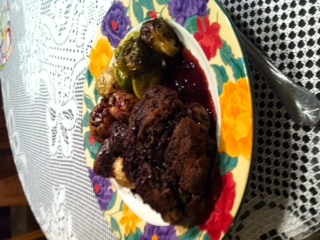 Oven roasted potatoes and brussel sprouts along with a braised beef tenderloin topped with a blue cheese/thyme/breadcrumb dressing in a red wine reduction sauce. What can I say? It was outstanding. Who cares about the temperature outside. It’s likely all in my head anyway. When one is beyond full-time, flat-out office work, you may partake in a more lingering lunch with friends….during the week. But then it says it’s best to elevate bruised area above heart level-and that would be difficult in this instance, no matter where you are-office or home. Please don’t ask for the pictures on this one. The above is a line from one of the many Christmas songs we hear on the radio at this time year. For many of us this time of year is filled with shopping, cooking, visiting and sending greetings to family and friends. The tradition of sending Christmas cards has waned from years gone by but it is still ever so nice to get mail that isn’t junk or bills. That said, at this house we’ve left it too long to do much in paper-at least anything that would be on time, so I thought I’d do something in the electronic media. You’ve Heard of Drug Interactions. It is my experience there are adverse technology interactions. Just as you shouldn’t take drugs together unless you have gained knowledge of the expected outcome, the same goes for using too many new-to-you programs, websites, mouse clicks and such in any one project. Anything that says “easy to use” is likely not. If you have questions about taking drugs-ask your lovely, knowledge and trusted pharmacist. If you have questions or problems about mixing the instructions of one program with the information from another website-you’re pretty much on your own. Frustrated and on your own. Off I went, then to do something simple but hopefully a little creative for our Christmas greeting. I used the Movie Maker/Xtranormal site to make a little movie. That wasn’t too bad. I’ve used it before. Then I thought I’d try to find some stationery. I found Pages on my iMac and played around with the templates and found something that could work. When Is A Download Not A Download. Linking the movie into the Christmas message shouldn’t be a problem. I add links to this blog all the time. Not so. There should be standardized ways of linking-world wide standards. If we can all agree on the shape of a stop sign, surely the way we add links could be standardized. Add to that my inability (until I read Q&A’s and chat forums) to effectively download the movie in a reasonable format and well, let’s just say, I was feeling challenged. I was to not simply download but it had to be a HQ Download..oh yeah…well what’ s that? And there was something about an MP4 file-remember I’m the one who still owned the now-recalled 1st gen iPod and now there’s MP4? Here’s the Christmas message, ultimately. I will spare you the Pages document. When I stepped aside from full-time work earlier this year, one of my special gifts was from an IT colleague who was more than aware of my IT (in)abilities. This gift sat next to my computer desk. Good think I had taken a picture of it before embarking on the Christmas message-it’s gone missing. My husband mentioned something about removing from the computer area, any objects that might be used to pummel technology. Merry Christmas, Happy Holidays and May All Your Technological Efforts Be Effortless in 2012! Please tell me I’m not alone. Not all that long ago we took a road trip. We journeyed quite a distance into and across the states of New York and Massachusetts. We were well inland during the trip. It was late fall and there was some colour left in the trees-all in all a pretty drive. Parts of the drive that were not so scenic were the many deserted warehouses and factories-sitting derelict and sometimes vandalized. They tell of a time, decades ago, when those building housed vibrant industries and employed many people. One building that has been rejuvenated and beautifully so is the former factory that now houses the Massachusetts Museum of Contemporary Art or Mass MoCA in North Adams, MA. It is the largest museum of contemporary art in the United States. The museum is on the site of a former textile printing factory. As you walk up to the museum you come upon trees in an unusual spot. There are several buildings and floors of exhibits. The exposed brick and hardwood floors provide a wonderful background for art. The exhibit One Floor Up More Highly by Katharina Gross was housed in a space that is as large as a football field. 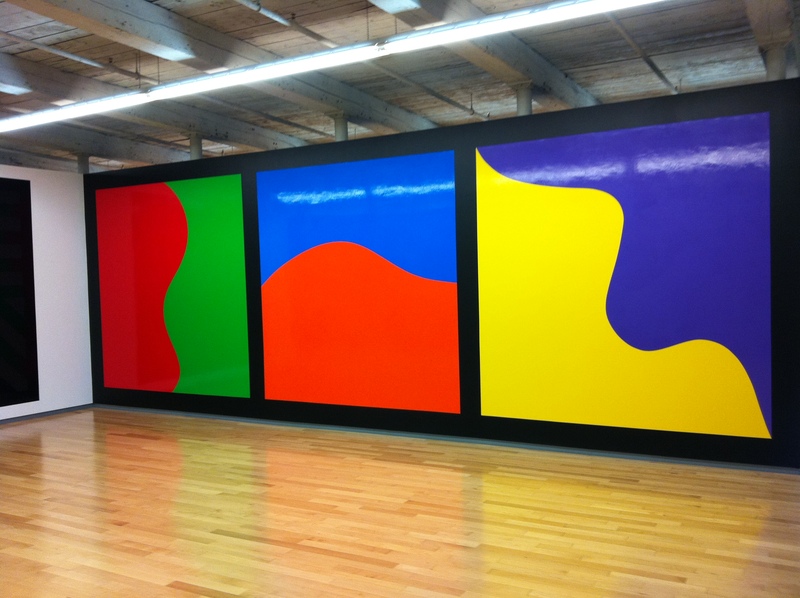 Three floors in the main building displayed wall art conceived by Sol LeWitt. 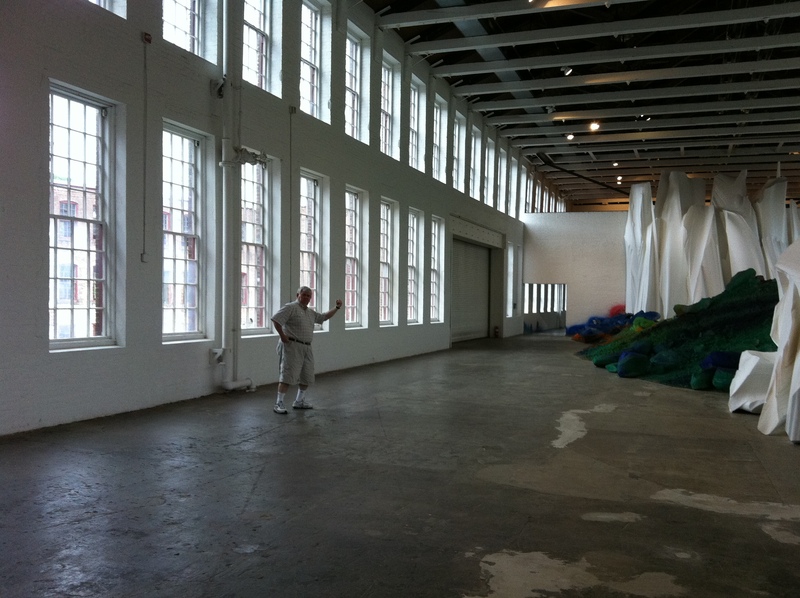 The exhibit will be at MASS MoCA for 25 years-you have plenty of time to see it. LeWitt‘s wall drawings were usually executed by people other than the artist himself. I compare it to designing Vogue sewing patterns and then others make the outfit. He would use teams of assistants to create his works. 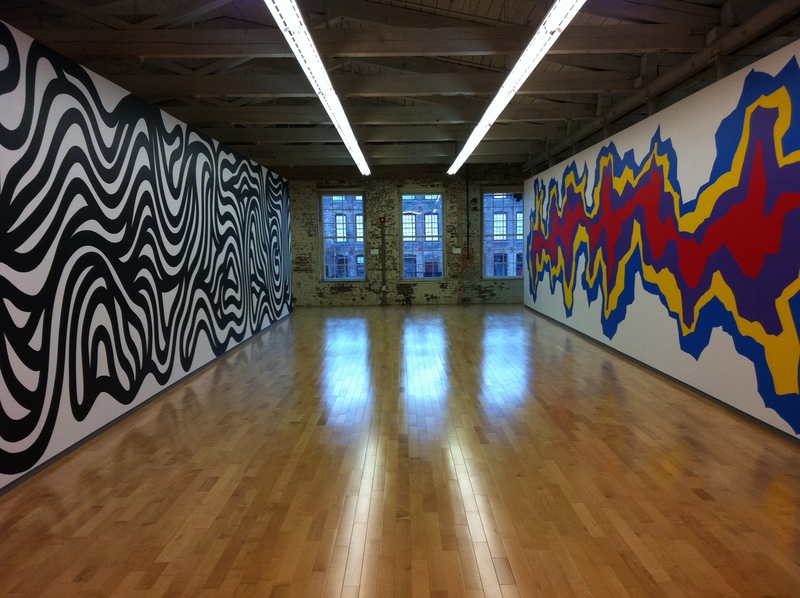 Between 1968 and his death in 2007, LeWitt created more than 1,270 wall drawings. The art and the manner in which it was created is remarkable. We thoroughly enjoyed the museum and plan to return to MASS MoCA. A good to do that might be after May 2012, there will be an exhibit of Canadian contemporary art – Oh, Canada . If you plan to go to North Adams, let me know, we have some thoughts on accommodation. 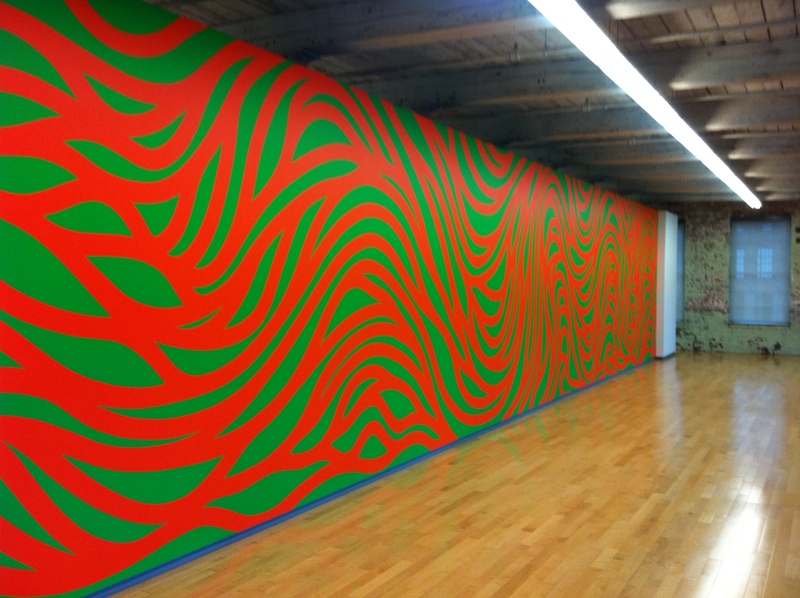 Have you ever seen Sol LeWitt’s art? I think we may have seen it in other galleries. I have a long-standing love/hate relationship with technology. Truth be known, that relationship extends to anything mechanical. It’s interesting to observe the jargon that each trade/profession uses too-is that necessary? Is it to keep the rest of us in the dark? Issue: The issue was simple, straightforward-to print a Word document double-sided using my iMac and HP printer. (In these days of trying to minimize the use of scarce resources, it seemed like a reasonable goal.). I can print double-sided from web pages..why not Word? Scroll through all relevant items on the menu bar, look under system preferences-oh look-a box to check off that says double-sided. Use the administrator name and password and make the change. Nada-no double-sided option appears when I go to print. Spend 2 more hours looking for things-search on the internet-there’s a forum-others have had the same issue-try those suggestions. Nada-no double-sided option appears when I go to print. Call AppleCare-we verify versions and lots of other stuff-check for upgrades-and in the end he says-it’s not Apple-“we’ve done what we can do”. It’s not me, eh, madam. You should call Microsoft. Call Microsoft-we verify versions and case history and look at drop down boxes. (After he asks if my printer has the capability of printing double-sided!) The double-sided option is greyed out and in the end she says “we’ve done what we can do”. It’s not me, eh, madam. You should call HP. Hard as it is to predict the future-this is my go at it….should I decide to pursue the challenge of printing double-sided from Word rather than just going single sided and using a bunch of paper: I call HP-we verify versions and look for upgrades. There’s no solution-and in the end, they say-we’ve done what we can do. It’s not me, eh, madam. It’s the paper-I should call the paper company. 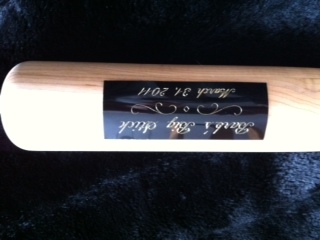 I call the paper company… and end up finally barking up a tree…likely the wrong one. Ah now I’m just getting silly.